Had such a wonderful trip to New Mexico, where my sister and her man, Greg, spoiled us with home-cooked meals like the hoecakes, country ham and sauteed apples pictured above. After a day of skiing at Taos, we visited friends from Memphis who had moved out to this hauntingly beautiful, wide open place, and were treated to Dave's homemade pizza. Later, we ate tamales Christmas eve and a huge hunka roast beef on Christmas Day, twice-baked potatoes and Caesar salad on the side. I can't remember the last time I went a week without stepping foot in a restaurant, and I was back on the job shortly after the plane touched down in Seattle. Wonder if there's anywhere in this fine city I can score some hoecakes and country ham? Nah, didn't think so. There's really no place like home for humble fare like that. What about you? Did you get enough to eat over the holidays? Starting to think about resolutions to eat less/exercise more come 2009? I was interviewed about dieting a couple of days ago, and said -- tongue planted firmly in cheek -- that I planned to cut back on deep-fried bacon come the first of the year! So, a few inches shuts down the city of Seattle. But a few feet in Spokaloo? No prob for that plucky place. (Official motto: The biggest city between Seattle and Minneapolis. Unofficial motto: At least we're not Tacoma!) That pic was taken Thursday morning in my BFF's front yard. I remember epic dumps while living in the Inland Empire, where people would cross country ski around town. 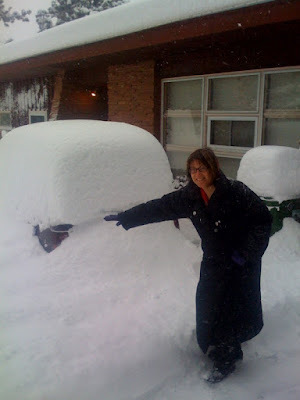 One winter, we couldn't even see the top of the car because the snow banks were so high. A white Christmas was almost always assured. It was all those years of dealing with snow that taught me the value of having a well-stocked pantry. I can cook for a week without going to the store. So, what's in your cupboard? It's not the snow, it's the ice!! No sign of any trucks spreading sand on the slippery streets of Seattle, but I set out on foot and found a bunch of "closed" signs. Ten Mercer offered a warm welcome, and a fabulous serving of curried mussels. A German riesling and the company of a good friend (did I mention there were presents involved?) and all seemed right in our frosty world. Just heard from Trevor Greenwood, formerly with Via Tribunali, who is on a team working to open a new place in Wallingford. "Cantinetta will be a neighborhood pateria emphasizing Tuscan culinary traditions, authentic hand-made pasta and seasonal ingredients from the state of Washington," he wrote in an e-mail. "Our lead chef is Brian Cartenuto and our sous chef is Morgan Brownlow." Cantinetta is scheduled to debut Jan. 3 at 3650 Wallingford Ave. N.
Phone 206-632-1000 for reservations for six or more. Cannot wait to take my friends Dan and Mary Pat there, as those lovebirds spend at least a month each year in Florence. Ciao baby! Got together with Bridget for our almost annual cookie baking marathon. This time, we did Martha Stewart's gingerbread and Aunt Minnie's sugar cookies. I have no idea who Aunt Minnie is, grabbed it from AllRecipes.com. Decorating those sweet things is tons of fun, though I feel humbled in the company of Ms. B and Claire, who give snowmen scaves and packages fluttering ribbons. Gorg! My strategy is to put as many sprinkles on as possible. Do you have Christmas cookie traditions? I sorely miss swapping cookies in Spokane with MP, Holly and Sandra. Nobody makes date pinwheels like SBB! And Holly is a true cookie artist. I also feel deeply nostalgic thinking back on the many years I went to holiday Mom/Daughter tea parties at Kate's house. That's the trouble with traditions. They leave a big hole when they go away. This motley crew of Alaska fishermen includes my nephew -- Brandon's the guy second from the right -- and I'd be lying if I said I didn't fret about his safety when he's out there. He recently gifted me a big bag of king crab, some of the sweetest I've tried. I sauteed it in shallots and butter and finished with a splash of white wine. I recently got an invite to go to a dinner where Captain Sig Hansen was the special guest and it pained me to have to turn it down; I'm a huge fan of the show, for obvious reasons. (Brandon's boat FV Karen Lynn has made only cameo appearances.) But I'm grateful to get a few cool crab inspiration reading over recipes from chef Justin Sledge, who created the dinner at the Salish Lodge and Spa. Here's the one I'm dying to try: crab and chanterelle chowder. Had so many memorable meals in 2008: Still thinking about the mmmm milkshakes at Lunchbox Laboratory. Took my cousins there for a lunch and we agreed that the shakes -- served in beakers -- were the highlight. More savory rememberances to come. I was just looking at the menu of a new sushi place in Ballard, where they have a "homeless roll". That is in some seriously bad taste!! Claire and I went to Kent over the weekend, not to IKEA, but to bake cookies with Aunt Irene. My late mother-in-law's recipe for sugar wafers, nicknamed "Little Bastards" because they're such a pain to make. So delicate, some crumble as they're slid off the baking sheet. They're so good, those that hang together, a sugary frosting sandwiched in between. This is the only time of year I bake cookies, not because I don't love them dearly, but because I don't need them around the house, calling: Eat me! Any cookie traditions in your home sweet home? This is what I love about the place, which I've written about in today's P-I in the Getaways section. Click here for the link. It's easy to pooh-pooh Washington's om-pah-pah village, but once you get away from the touristy parts of town, the valley is so beautiful. Naturally, looking at the sausage photo in the story jump-started the rumbling in my empty stomach. Is 9:30 too early for a bratwurst? Nah, especially if you eat breakfast at Sandy's Waffle Haus, where you can order German sausage with your eggs. JA! There were at least three references to Seattle in today's Dining In/Dining Out section, which focused on cocktails. The White Russians are coming! Courtesy of Lebowskifests and The Dude, a character based on a real-life slacker who once lived in Seattle. The Dude abides! Pic of Zigzag's bartender "making magic." Why the heck haven't I been there yet? Online sticky bits from chefsshop.com, another one of those many places I've been meaning to get into. Maybe today, followed by a ZZ cocktail and a round of bowling. In other exciting NYC news, my nephew Brandon is traveling there tomorrow and staying right around the corner from Momofuku Ssam Bar, which Frank Bruni gave three stars in today's review. Just walked back to QA from downtown -- in a miserable drizzle -- and couldn't help notice a whole lotta empty seats in some restaurants: Wann, Noodle Ranch, Mamma's, Kushibar were pretty quiet. Yet, Zoe was hoppin', as was Shiro's, Branzino, Wasabi Bistro, Txori. In this miserable economy, is it a matter of survival of the fittest? Everybody should be bringing that A game, and knocking down some prices. I had a very good meal at Dahlia Lounge: pan-fried trout, five-spice duck, shared a dessert. Two entrees, two glasses of wine, one dessert, couple cups of coffee. Not living it up, but it was still $100. Where's the best upscale dining value in Seattle these days?